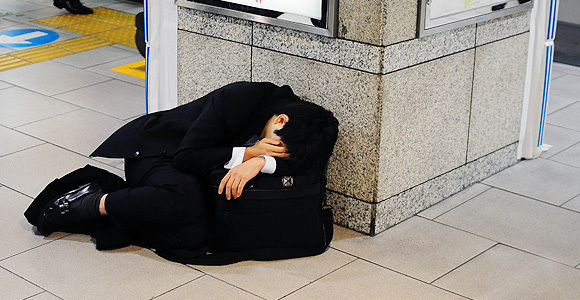 Karoshi: The Japanese Are Dying to Get to Work Working hard or hardly working? In Japan, you always know the answer. You may have read or heard how hard working and dedicated the Japanese people are towards their jobs. Consistently they put in long hours and undying loyalty to their employer, and in return they get a cushy pension, benefits, and life-time employment (although the guarantee of life-time employment is not what it used to be). But what is the cost of loyalty towards ones company? For some, it’s death. Certainly the concept of overworking yourself to death is not unique to the Japanese, however the country perhaps does take the issue more seriously than others. Coined with the term 過労死 (かろうし, karoshi; added to the Oxford English dictionary 2002), overworking to death has become a problem in Japan and a favorite topic to cover among the media circles; As a social issue by the Japanese media, and as a characterization of the Japanese society and culture by foreign media. Causes of death by overwork are from developed health issues that result in heart attacks and strokes due to long periods of high-level stress. It can also lead to suicide, which is given its own term, 過労自殺 (かろうじさつ, karojisatsu; literally translated to overwork suicide). 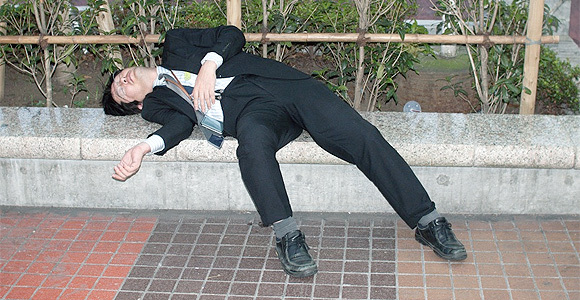 The first recorded case of karoshi occurred in 1969. Nearly a decade later (1978), the concept was given the name “karoshi”. In 1982, the release of the book entitled Karoshi by Tajiri Seiichiro, Hosokawa, and Uehata brought the issue in the public view, but it wasn’t recognized as a major social problem until the 1980’s Bubble Economy. A few high-ranking corporate executives died without any hints of illness leading up to their deaths. The deaths were picked up by the media, which promptly developed growing concerns from the public. They had every right to be concerned, since they too were putting just as many hours into their jobs as the dead executives. Concerns reached to the point where the government took action and started collecting and publishing information on karoshi as a cause-of-death option. According to the Labor Force Survey, nearly one-fourth of male employees (7.8 million) clocked in more than 60 hours per week of work in 1988. Based on the numbers in 1975, it’s nearly a 2.4 times increase. Even though the statistics threshold is 60 hours and above, a typical work week can easily be 70-90 hours per week. Why do this? To show loyalty to their company. This loyalty stems from the Japanese culture of living for one’s master and superior. More often than not, the extra work is done as cloaked overtime (furoshiki), where the employee does his work off the clock and the employer turns a blind eye. A survey conducted by the government showed that 90% of workers didn’t understand the concept of work-life balance. Four out of five would cancel any dates or plans if their boss asked them to work overtime. More recent statistics showed the situation hasn’t changed. According to the International Labour Organization (ILO), 28% of Japanese employees worked 50 hours or more per week in 2001. The percentage is significantly a lot higher than many European nations: Germany (5.3%), Finland (4.5%), Sweden (1.9%), and Netherlands (1.4%). Japan is on the same level with the U.S. as developed nations that put in the most work hours, although many believe that the Japanese work significantly more hours than the U.S.. A lot of the Japanese overtime hours are left unrecorded (cloaked overtime), therefore not taken into consideration when generating the statistics. In 2005, the MHLW reported 328 Japanese employees who suffered karoshi. The number is a little over 7 times higher than the recorded result in 2000. Bear in mind that the statistic numbers are believed to be not on par with reality. Many families accept the death with silence and don’t push the issue any further. And most companies won’t outright accept responsibility for the deaths. Lawyers and scholars estimate the annual number of karoshi victims to be in the ballpark of 9,000 deaths, which is near the annual number for traffic fatalities. To put some of this into perspective of how severe the overworking can be, let’s consider a karoshi case. Hiraoka Satoru’s story was featured in the November 13, 1988 Chicago Tribune’s article Japanese Live and Die for their Work. A foreman in charge of a ball bearing factory, Hiraoka usually clocks in 12- to 16- hour days, easily totaling up to between 72 to 95 hours a week for most weeks. The prior three years before his death, he clocked in at almost 3,700 hours annually. A typical 40 hr work week with no vacation equates to 2080 hours annually. The thorn in most of the karoshi victims’ side is that they are often not compensated for the overtime work. How is karoshi being handled? A few Japanese companies are making some effort to reduce karoshi and promote a work-life balance to their employees. For example, Toyota has set a hard limit of 360 hours of overtime annually. In addition, some of their offices play a recorded message every hour during the evenings urging the staff to go home and get some rest. Some companies enforce no overtime days where everyone must leave the office at 5:30 pm. Sometimes the measures implemented by these companies aren’t enough for the employees. While on paper it may seem like they are recognizing the problem, the competitive work environment demonizes those who decide to partake in these policies. For example, Mitsubishi UFJ Trust & Banking has a program that allows their employees to go home up to three hours early to care for children or elderly relatives. Only 34 out of 7,000 employees are signed up for the program. Frustrated with the situation, more and more workers and/or their families are taking on their negligent employers in court. Some individuals are avoiding the situation entirely by taking on short-term jobs, rather than be a worn out salaried cog for large companies. Although the pay and benefits don’t match to a corporates compensation, the work-life balance is significantly better. There is this adage I like to use when differentiating U.S./Japan work culture to the European style: U.S. and Japan live to work, while the Europeans work to live. I do believe that everyone should give their 100% effort in performing their jobs, however having your health deteriorate to the point of death is certainly not worth it. Many Japanese are slowly coming to realize this. 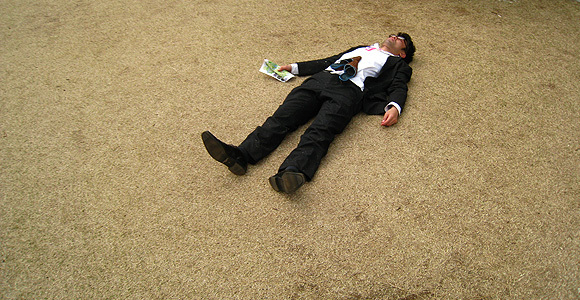 Karoshi Strikes Japanese Businessmen, British Medical Journal. Vol.303, No.6815 (Dec 7, 1991) Print.